Truly exceptional luxury boutique hotels are few and far between in the Asia-Pacific region, but there is one that just about everyone agrees is worth all the hype—Hong Kong’s 116-room modernist masterpiece, the Upper House. 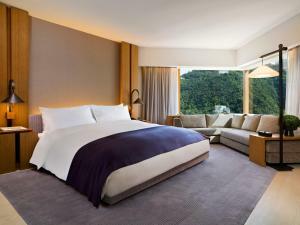 Perched atop a JW Marriott, and itself formerly a Marriott serviced apartment residence, the Upper House is a hotel lover’s hotel, with enormous rooms (Hong Kong’s largest, the hotel says) meticulously styled by local designer Andre Fu, and boasting not only cutting-edge design, but also impressive technology. Rooms, which start at 68sqm, come with dual temperature wine cellars and an iPod touch with a custom designed Upper House app. Free mini bars are something of a cliché in Hong Kong, but the Upper House’s curated in-room food and drink selection stands apart from the rest. It even boasts a fully stocked wine cellar (not free) in some rooms that is considerably better than your editor’s modest one back home. The hotel lacks both a spa and a swimming pool, but with bathrooms boasting floor-to-ceiling windows, deep-soaking limestone tubs and bath amenities to rival any luxury spa, you literally don’t need to leave your room to reach nirvana. Opened in 2009, the Upper House is from Hong’s Swire Group, a British company that has been linked with Hong Kong since 1865—and is also the parent company of world-leading airline, Cathay Pacific. Price-wise, rooms here are on par with those of the Peninsula and the Landmark Mandarin Oriental, our top picks for Hong Kong in the 5-star category. But if discretion and understated modern design are your thing, then look no further than the wood, glass and limestone palace that is the Upper House. The hotel does have one tiny flaw—it’s website, a flash-heavy calamity that is about as useful as a garden sprinkler in outer space.